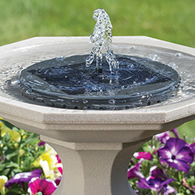 The Solar Fountain Birdbath Insert from Duncraft adds a new wrinkle to any water feature. Instantly transform your birdbath into a solar-powered water fountain and enjoy the soothing sound of the fountain while providing moving water for birds. The sound of moving water attracts more birds, so the Solar Fountain Birdbath Insert from Duncraft will boost the popularity of your birdbath and feeding station with resident and migrating birds alike. 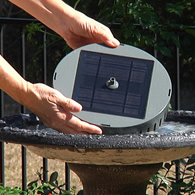 Measuring just two inches tall and nine inches in diameter, the insert is made of durable gray ABS plastic with the solar panel positioned on the top. Duncraft offers plenty of decorative birdbaths to choose from too. The Duncraft solar fountain requires overhead sunlight to operate, but never fear, birds will still have fresh water even if the fountain is not operating during extended cloudy or inclement weather – and there is no electric plug-in to worry about. Add a touch of class to your water feature with an affordable solar fountain insert.